Being someone who absolutely loves to travel, this month’s Hero Arts Kit was calling loudly to me. The images of Venice transported me back to that wonderful place. The laundry line reminded me of Naples and the background building reminded me of the view of Florence from a viewpoint over the city. I was done for when I saw the add on die set called European Village. It reminded me so much of Canterbury in England with its’ cottages and cobblestone streets, it had to go in my cart. The card turned out well. Once more my Dirty Sand embossing powder from Emerald Creek came in hand to give the cobblestone road some texture. It is kind of funny how images of certain animals suddenly become popular. They pop up on everything from clothes to home decor and , of course, cards. Recently it has been llamas that have been in the trendy spotlight. I saw this llama die from Spellbinders, and it was too cute to pass up. I don’t usually like die sets without stamps, but this guy had all the details to look great on his own. Paired with the Paprika paper collection from Photoplay, it was perfect. 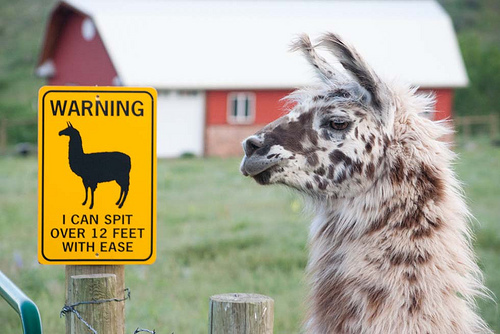 When checking out the correct colours for llamas, I found this interesting warning sign. Photo is by Lutty Moreina. This is a case where the operation was successful but the patient died. I love the look of the card, but sadly it will not actually work. I don’t even want to discuss what I did to render it useless, but useless it is. 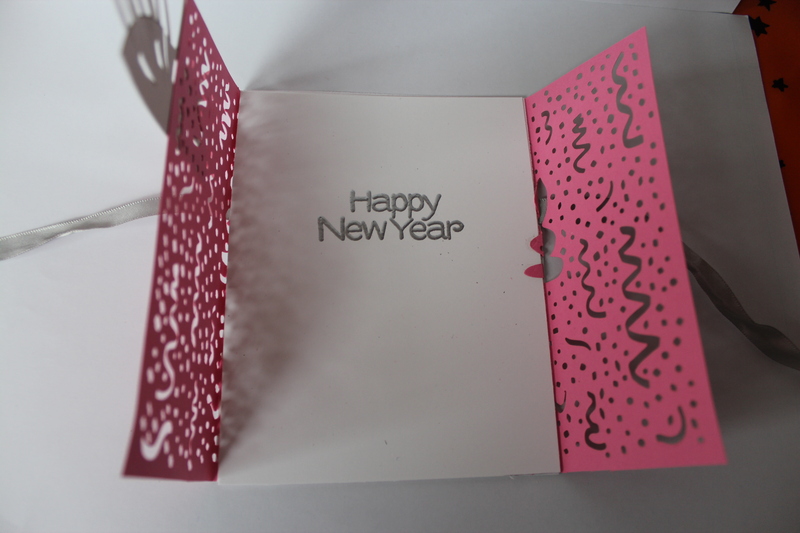 I will be remaking this card when I am not sitting in a messy house with company coming in a few hours. 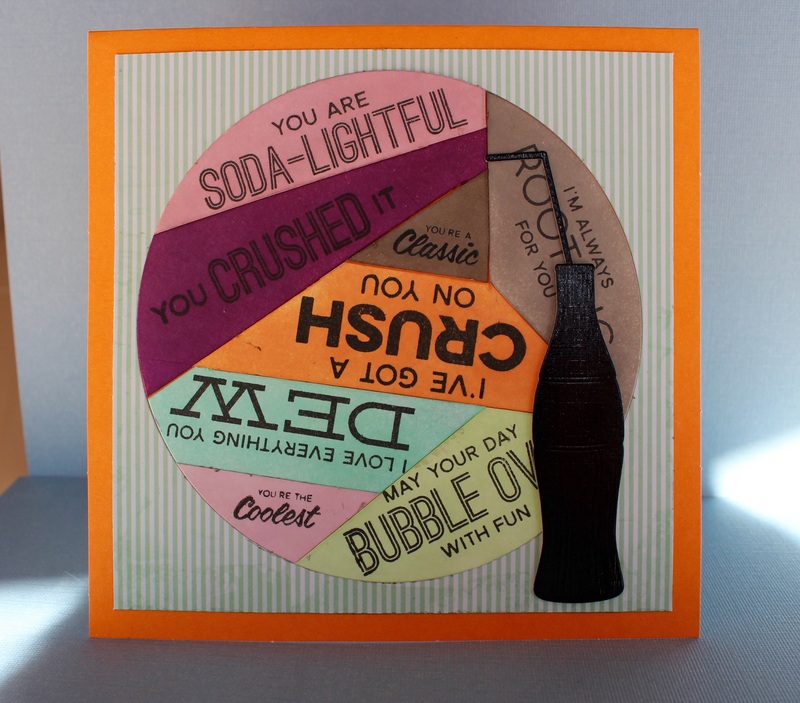 The challenge in this week’s Make it Monday was to use a window to emphasize a sentiment on a card. 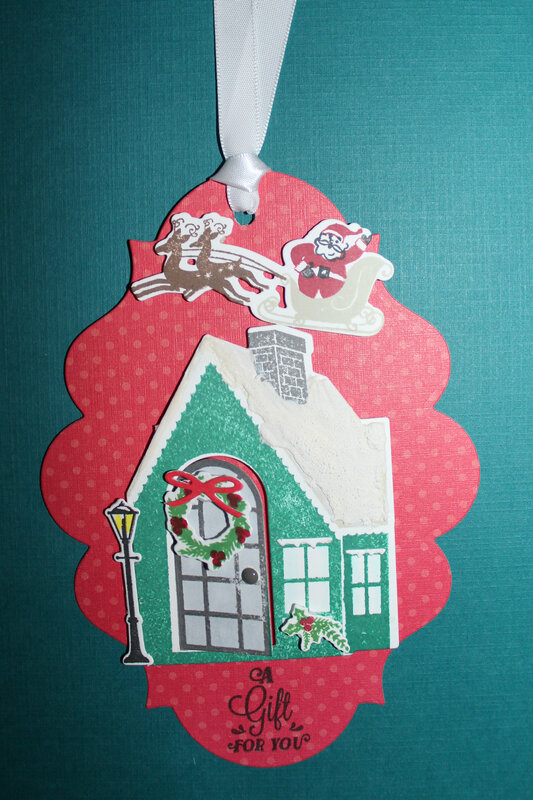 I decided to use the Shakers and Sprinkles die set to make the window, the Joyful Christmas stamp set and the All through the House patterned paper to put this card together. It was amazingly easy to do and turned out well. It is that time again! Time for another Coffee Lovers Bloghop. Time for me to be astounded once again at the number of never seen before coffee, tea and cocoa cards that can be created in one week! I rarely put ready made stickers on cards, but these ones from Doodlebug were just too cute to ignore. Then when I saw the Doodlebug paper that matched the stickers, it was all over. Doodlebug Cream and Sugar patterned paper and stickers, Create a smile chipboard coffee, Simon Says stamp coffee cup die, Dienamics Blueprint 27 dies, Woodgrain paper from Paper and More, Simon Says Stamp card base and Scor tape. 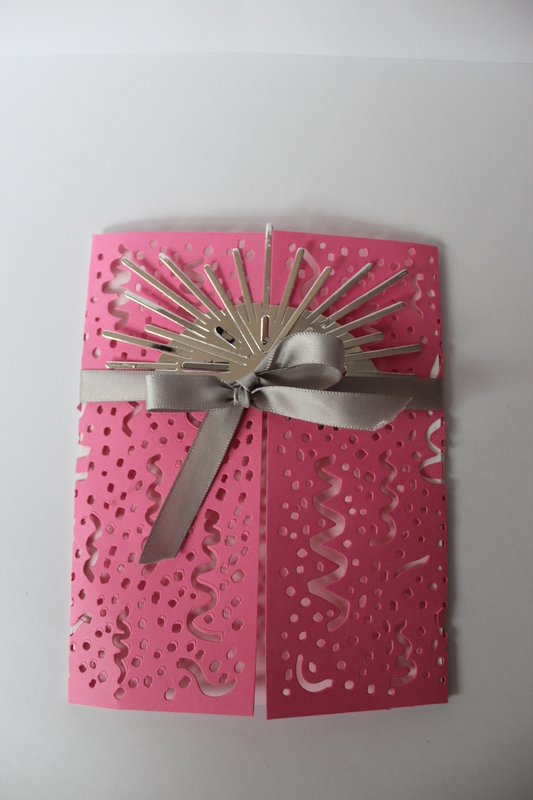 I had so much fun making my light up card yesterday, that I wanted to make another one. This time I made a card that fits the criteria of the Wild Card class and the Simon Says Stamp Monday Challenge so I could link it to both. Simon Says Stamp is featuring Memory Box this week and the theme is Halloween. I have a great Bat Cave die from Memory Box so it was great for the theme and lent itself to a light up card as well. I think the card turned out really well. Memory Box Bat Cave Cutout, Tim Holtz Halloween Cutouts stamp set, Tim Holtz Distress Paint, Unknown orange embossing powder, Recollections vellum, Scotch 3M foam tape, Papertrey Ink LED light, micropore tape, Simon Says Stamp top folding card base, Scor tape. 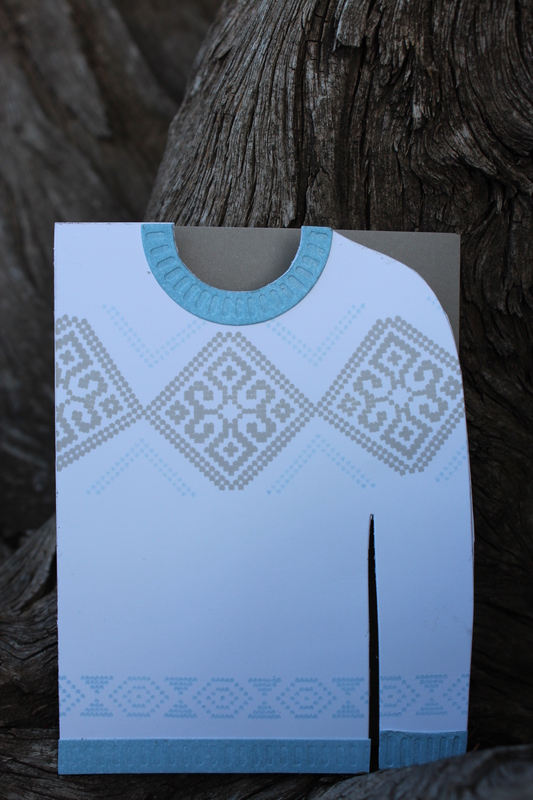 I still love designing sweaters via stamp sets. 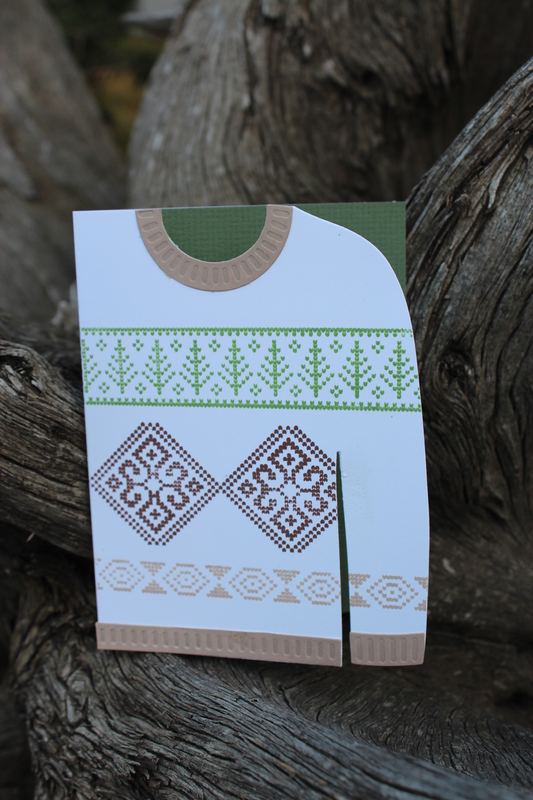 Last year they were of the Ugly Sweater variety and I still like making this type of card. With the wonderful sweater die and the Fair Isle stamp set from Papertrey Ink though, this year I can also make a wonderfully pretty sweater. Here is my first two attempts. I want to make more, using also the wonderful plaid paper from Papertrey Ink. 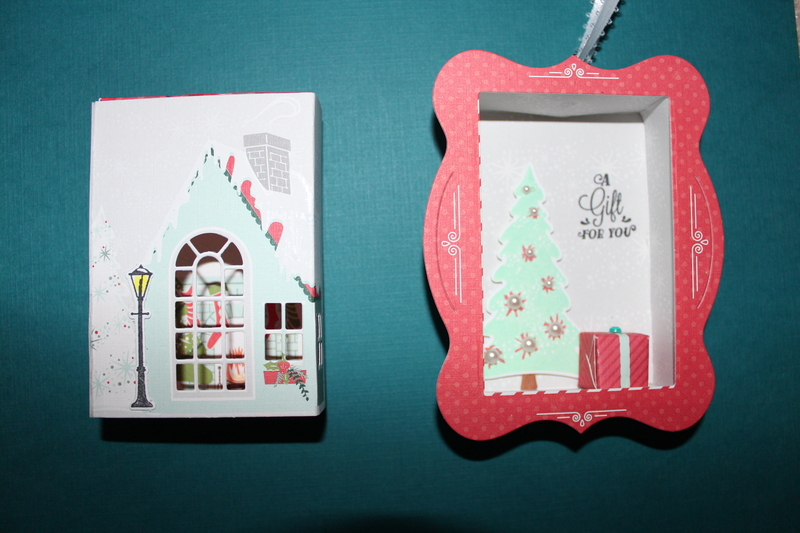 Recently, I purchased Papertrey Ink’s All Through the House Holiday Kit. Usually, I am not much of a kit fan, but this one drew me in from my first look at it on the Papertrey website. Now that I have the kit in my hands, I realize that it is twice as amazing in real life. The attention to detail in the stamps and the preciseness of the dies is truly remarkable. Even more remarkable given that it is all in MINI size. For example, there is a Santa in the sleigh with reindeer that is only 3/4 of an inch tall and 2 inches long and uses 4 stamps to make it and 1 die to cut it out. For a klutz like me, success in lining up 4 stamps should be impossible! But…………you know what………….I was able to stamp and cut it repeatedly with no issues. The biggest challenge was figuring out exactly what all these little dies were supposed to cut out. 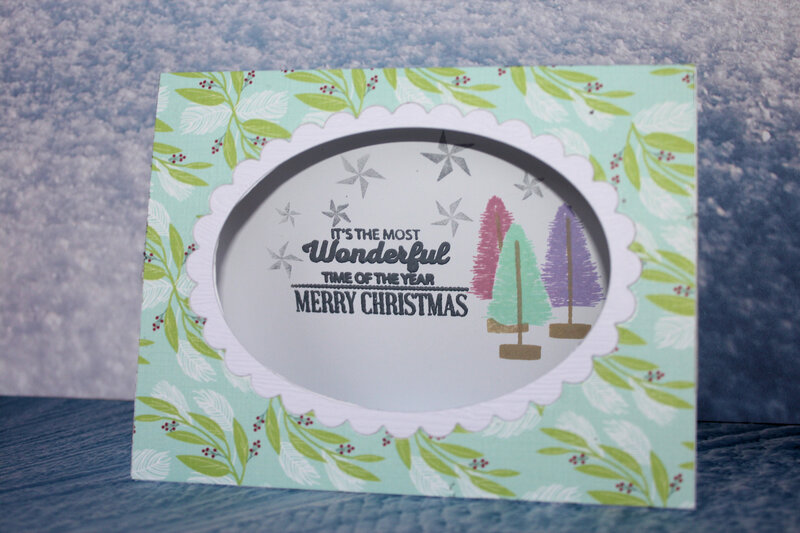 For a while I was trying to use a die of Santa’s boots to cut out a holly bouquet…………..which did not work out too well, I always have fun when I am playing with paper but this kit is twice as much fun as usual. First it is like putting a jigsaw puzzle together, to figure out what all the teenie tiny stamps do, and then you have the fun of creating a complete scene with them. Double the fun! Well triple the fun if you count the fact that you can either stamp your own scenes or use the pre-printed scenes that come on the paper include in the kit. Quadruple the fun, when I take into consideration that I am pulling out of my stash tiny embellishments that seemed too small for anything before. 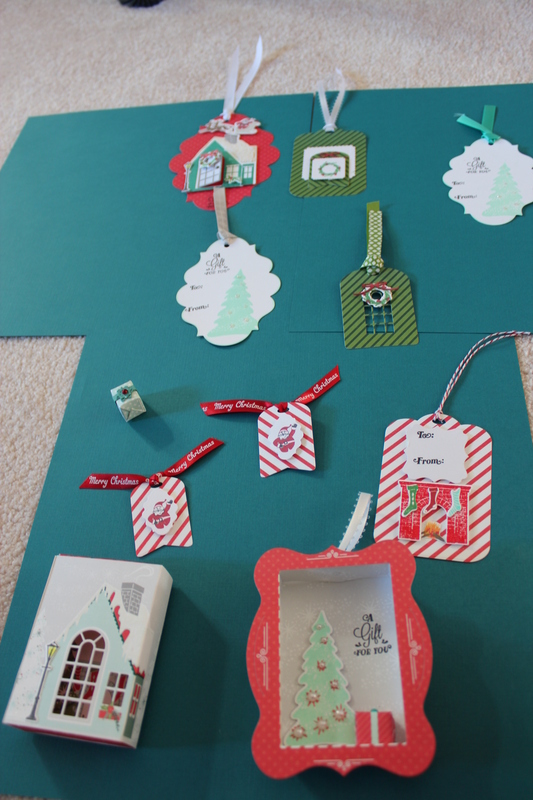 If you use the kit in an assembly line manner, you could make all your Christmas tags in one day. I was too anxious to see how I could use all the elements so I made tags and gift card boxes one at a time, which takes much longer. Stay tuned for more boxes, including some with teenie tiny LED lights that light up the windows in the house. They were on backorder but are on their way to me now. My Favorite Things has a new sketch Challenge this week. 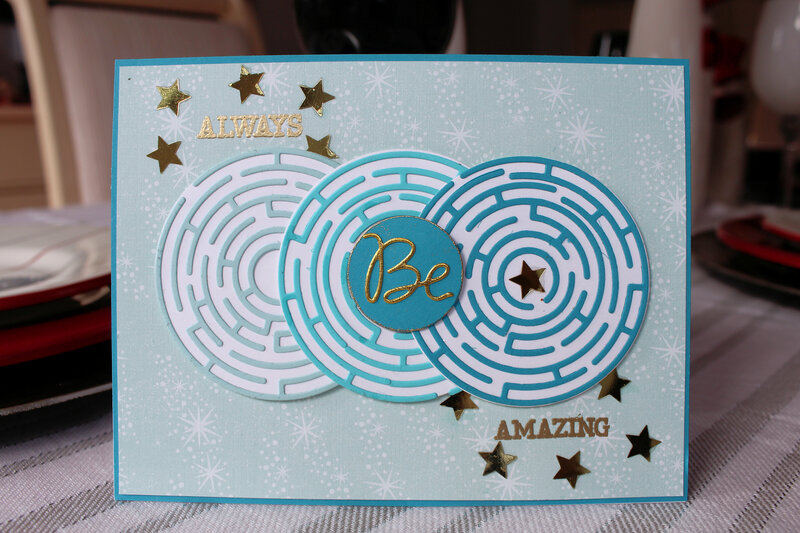 Sketch is very simple………….just a mosaic circle on a plain card base. Good thing that there were Design team samples that indicated that the sketch could be loosely interpreted. What I noticed right away in the sketch was the mosaic pieces so I decided that would be my main focus. I had just received a new stamp set from My Favorite Things with several related but distinctive sentiments included. Perfect for a mosaic says I………………………………..
Supplies: My Favorite things Soda Pop stamp set, Dynamics Soda Pop Bottles die, Hero Arts and Simon Says Stamp dye inks, Versafine dye ink in Onyx black, Lifestyle crafts circle die, Recollections card base, Dear Lizzy Lucky Charm 6 X 6 patterned paper, Tombow tape runner and Scor tape.